Wholesale Trader of a wide range of products which include water coolers with inbuilt aquaguard uv purification, water coolers with inbuilt aquaguard ro purification and water coolers. We are one of the leading wholesaler trader and suppliers of Water Coolers With Inbuilt Aquaguard UV Purification. Ultraviolet (UV) rays are proven to be effective in killing harmful bacteria and microbes, and neutralizing dangerous chemicals that may be present in drinking water. At the same time, the treated water retains all its minerals and salts. That is why Blue Star's Water Coolers with Aquaguard UV filtration use ultraviolet radiation as a pre-treatment to sterilize and disinfect the water before it is available at the tap. These coolers also come with a further two-step filtering process that removes physical impurities, color, organic impurities and chlorine from the water before it is dispensed at the faucet. 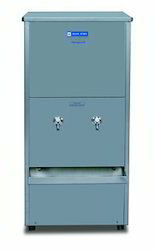 A unique feature of these coolers is the last-point purification using UV technology that ensures that water dispensed remains pure and uncontaminated even during the post-filtration flow. 2. Activated carbon cartridge for removing color, organic impurities and chlorine. 3.UV disinfection chamber to disinfect waterborne disease-causing bacteria and viruses. Monitors the purification process and stops the flow of water using a solenoid valve, if purification is inadequate. Has unique 3-stage purification which ensures that the user drinks safe and pure water. It is backed by Aquaguard, so its rest assured that the water is 100% safe. The cooling system is very powerful and effectively faster. Blue Star: Leading Manufacturer of Water Coolers, Milk Coolers & Commercial Refrigeration Products in India. 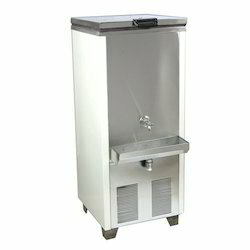 We are one of the leading wholesaler trader and suppliers of Water Coolers with inbuilt Aquaguard RO Purification. Pure, Cool Goodness In Every DropWater Coolers With Inbuilt Aquaguard RO PurificationNow enjoy cold drinking water that is 100% pure too! With over seven decades of experience, Blue Star - India's leader in air conditioning and refrigeration solutions - has always been at the forefront of innovation and R&D, bringing you cuttting edge products and solutions that offer you more. Impure drinking water is one of the main sources of infection, even mild poisoning, in many cases. Hence, it is important to inbuild purification processes in the water cooler. That is why these Blue Star Water Coolers incorporate everything that is required - reliable cooling systems, RO purification and contaminant filtration - all within the same housing, integrating the systems together for seamless, efficient operation. They are therefore comprehensive and compact solutions for safe, clean and cold drinking water. 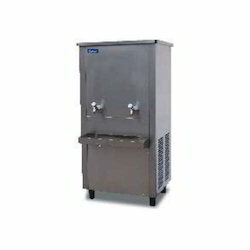 The Blue Star range of storage water coolers with inbuilt Aquaguard is also designed for faster cooling and with larger storage tanks, to cater to high-volume requirements in schools, colleges, corporates, factories, hospitals, and public spaces such as railway stations, airports, pilgrim centers and petrol stations. Blue Star's Water Coolers with RO filtration use robust Aquaguard RO technology to bring you chilled drinking water that is safe to drink. Besides the RO filter, this range of unique Water Coolers offers a further range of 6 more filters that make the water safe to drink, both chemically and microbiologically. The filtration process lowers the hardness level of the water as well as the levels of Totally Dissolved Salts. It also reduces the levels of arsenic, lead, and mercury, which are dangerous heavy metal contaminants in many water sources. Pathogenic microorganisms are also eliminated by the filtration process. Unique polypropylene yarn candle to remove physical impurities from input water. Specially treated pre-carbon block for absorbing color, organic impurities and chlorine. Anti-scalant filters to prevent deposits over the RO membrane. 4. The sediment filter traps all the fine sediments present in the input water. RO membrane filter (porosity of .0001 micron) strains micro-organisms and TDS from the input water. Post-carbon filter to enhance the taste of purified water. Nano-silver leaching effectively prevents microbial contamination in the storage tank. Blue Star : Leading Manufacturer of Water Coolers, Milk Coolers & Commercial Refrigeration Products in India.